Looking down at an initiated youth sitting cross-legged on the ground with a fireplace in the background. He is wearing a European comb on a chain attached to a giraffe-hair necklace, and has his hair plastered with dung ash into a single horn-like projection at the front, decorated with dark lines. Such plastering was part of the process of dying the hair a reddish tinge. 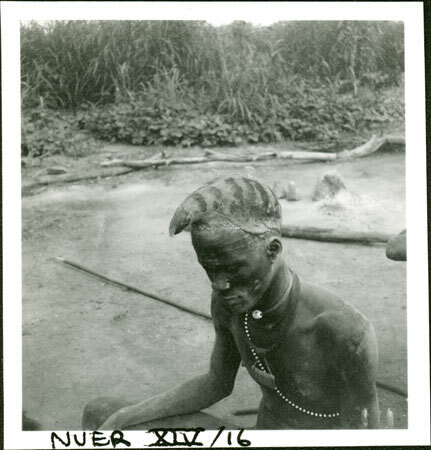 It was almost certainly taken during July 1935 whilst Evans-Pritchard spent 4 weeks at the mouth of the Nyanding River among the Gaajok, especially at Mancom village, the home of his servant Tiop-Lier. Note on print reverse ms pencil - "41 5" & print front border ms ink - "NUER XIV/16"
Morton, Chris. "Nuer youth hair decoration" Southern Sudan Project (in development). 03 Jan. 2006. Pitt Rivers Museum. <http://southernsudan.prm.ox.ac.uk/details/1998.355.658.2/>.